This recipe was originally in Bon Appétit, which claimed that they ruined any other chocolate chip cookie because they’re that much better. Spoiler: they don’t, and they’re not. They weren’t even that great when I made the first batch as instructed, ending up too flat and nearly burnt. I tried lowering the temperature, but they spread out even further and were way too thin for my taste. BUT, then I used the rest of the dough my way. I made them regular-sized instead of small, I put the dough from the fridge straight to the oven, and I baked them for less time. And they were really good. Will I make them now instead of the 36-hour cookie? No. 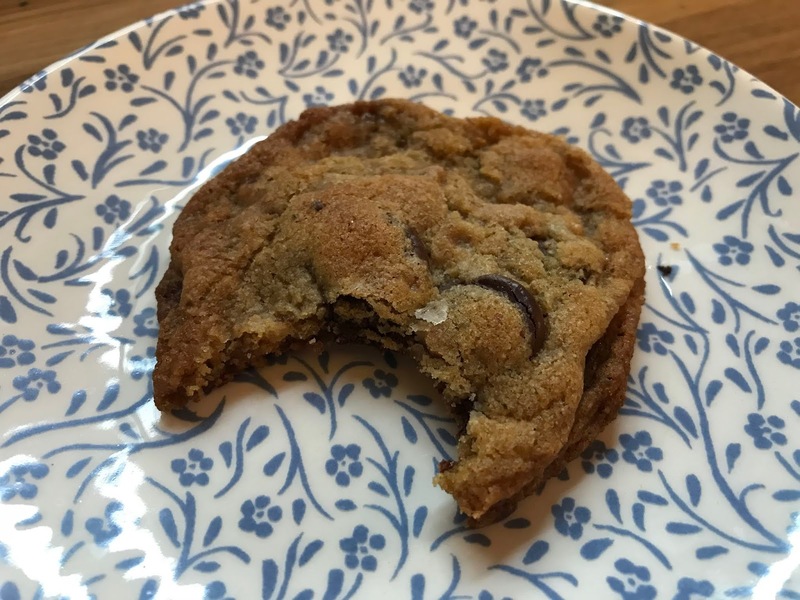 But sometimes, sometimes, people want something other than the straight-up chocolate chip cookie, and this fits the bill. 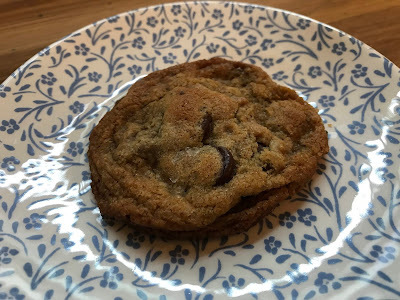 The version below is the way I made them, including using a bag of Heath toffee bits instead of chopping a toffee bar (because the latter sounded like a horrible use of my time). Add brown sugar and granulated sugar to browned butter. Using an electric mixer on medium speed, beat until incorporated, about 1 minute. Add eggs and vanilla and beat until mixture lightens and begins to thicken, about 30 seconds. Reduce mixer speed to low; add dry ingredients and beat just to combine. Mix in toffee pieces and chocolate wafers with a wooden spoon or a rubber spatula. Let dough sit at room temperature at least 30 minutes to allow the flour to hydrate. Dough will look very loose at first, but will thicken as it sits. After this, refrigerate the dough until you are ready to bake (mine was cold when I baked it; if yours isn’t, you’ll need to reduce baking time accordingly). Place a rack in middle of oven; preheat to 375 °F. Form balls of dough and place on a silpat-covered baking sheet (I baked 6 at a time because I was testing various factors to tweak the recipe, but you could probably fit the typical 12 to a sheet). Do not flatten; cookies will spread as they bake. Sprinkle with sea salt. Bake cookies until edges are golden brown and firm but centers are still soft, 9–11 minutes. Let cool on baking sheets 10 minutes, then transfer to a wire rack and let cool completely. Repeat with remaining dough.